Please visit www.saarcatering.com for more details. Accept parties 20- 70 people in the main dining room. SAAR is a modern Indian bistro in Midtown Manhattan helmed by celebrated Tandoor Master Chef Hemant Mathur and his wife, acclaimed Chef Surbhi Sahni. The 64-seat restaurant and bar showcases authentic regional comfort food in a cozy, eclectic setting inspired by Chef Mathur’s home city of Jaipur. The menu features a unique combination of traditional home cooked and Indian street foods, reflecting the essence of India’s broad multicultural influences – including elements from British, Persian, and Jewish cuisine. Service includes lunch and dinner. The tandoori lamb chops on the pre-theatre menu were the best I’ve ever tasted. The prices are not low, and the portions are small, but the food is amazing. We ordered an extra dish and we ended up sated. It was definitely worth it and we will be returning often. They did not have enough people serving. The ones there seemed inexperienced, and the one with experience was a bit arrogant. They were super busy, they did not check on you to see if you need anything. We struggled to get their attention. Food was tasty, but i prefer more of an authentic set-up. This was supposed to be fancier (nice plates, utensils, etc), but with the service of a cafeteria. Food was average at best and not worth the price. Service was inconsistent. Several items we ordered were forgotten and had hard time getting bill. Staff didn’t seem happy. Restaurant was not busy at that time so lack of attention didn’t make sense. On the plus side, interior of restaurant was nice and comfortable. A great place before the theater. Would highly recommend the price-fixed menu before theater. Excellent choices! If you're in the theater district, this is a great alternative to the typical touristy type places. Ambiance was relaxing and food was very good. If you're seeing a 2pm matinee however, they don't open earlier than 12pm. We thought it was plenty of time for a party of five, and we barely made our show. I'm not sure if they were short staffed, but we hardly saw our server. The cocktail menu looked phenomenal and we were eager to try some of their more unique drinks, only to find they don't have a bartender at lunch. A bit of a disappointment. I will say for the price and quality of the food however, you can't beat it in the theater district (where at most places food is just okay, servers rush you, and everything's overpriced.) $21 for three courses and the portion sizes were perfect. Even my 13-year-old picky eater found something he liked and loved it. We will for sure make this our go-to any time we're in the area! The food was inventive, inspired, and tasty and the service was amazing. I spilled my mango lassi and received a new one, new appetizers and much kindness. The ambience was nice and calm, though it was very late, so I'm not sure what it's like during dinner rush. Would definitely recommend! Only complaint—we were a bit pushed into ordering the samosas for appetizers and although neither of us is a samosa fan we tried them. I’ve had much better. The staff is very friendly. Service was excellent. A bit over priced. The butter chicken is delicious. Wasn’t crazy about okra salad. Very salty. Great food. Service slow. Waited forever to get waited on and we were only one of 3 tables. Everything else was top notch. Did I mention the great food! Tucked away in a less attractive side street, but with nice ambiance inside. Set up to accommodate large groups -- which may create a noise problem at times. But not in our case, having dinner before a concert a Carnegie Hall. Dishes come in three sizes (small, medium, large) with the usual offerings of Indian breads as sides. Again, very convenient for larger groups and sharing dishes. Of the small dishes we really liked the smoked eggplant dish whereas the cauliflower lattkes (prominently featured) left something to be desired lacking distinct character/flavor. Truly outstanding was the slow cooked goat stew, a dish hard to find otherwise. Both puri and parathas were very good. We had a 7 friends reunion lunch. The food was excellent - we had a number of dishes to share and 3 desserts. We had fish, goat curry, Indian risotto, two chicken dishes and two kinds of chicken. All delicious. The food was delicious and the staff excellent! Overall, interesting food.... be sure to note that it isn't Indian Indian food.... it is fusion Indian with some... very American touches (eg cauliflower). good drinks. We went for the $20 brunch deal. On paper the menu looks amazing. The dishes are very interesting and different from standard Indian restaurants. Appetizers were amazing, especially chicken and lamb kebabs. However, rest of the meal was disappointing. Our group ordered almost every entree on the menu, and we didn't like any very much, and outright left a few uneaten. The flavors just didn't shine. Second visit to this restaurant, and I've left disappointed both times. Great place! Took my dad for his 50th birthday and he loved it. Unique food options and drinks; would highly recommend! I had dinner here at 6pm on a Friday night. The menu is fairly limited, but my friend and I both looked forward to a lamb stew. We were informed that there was only one portion available. At 6pm on a weekend night, they ran out of the this dish. I let me friend have the stew and we asked for it to be moderately spicy and indeed it was. I love lamb, especially at an Indian restaurant, and the only other lamb dish was lamb ribs. I was told that they could be prepared moderately spicy. The lamb ribs were just not good. No spices at all, no taste at all. Service here was excellent and the restaurant is beautiful. But please, with a limited menu, all dishes should be available ! Excellent service. Very tasty food & wine. Ample portions! Excellent food, beautifully presented, outstanding service, vegetarian and gluten free options. Pre- theater pre fix dinner was a great value! A gem! Food was DELICIOUS!!!! Service staff were warm, kind and more than competent. It was a casual feeling place and other guests seemed as happy as our table was with everything presented. We will be back!!! The food was very delicious and service couldn’t be any better. I believe the owner was on site and he was very hands on, you could clearly see how much pride he took in the restaurant. He even had my coat waiting for me after I returned from the restroom before I left and helped me put it on. It was a great overall experience. I highly recommend! Really good food. Solid service. Quality and creative cocktails. The room looks much fancier on the website, but it's perfectly fine. Some of the best Indian I have had in NYC in years. Had dinner before a show and it was delish! Servers were so friendly and accommodating! First visit was mediocre, second visit was horrendous. Waitress had a huge attitude and the food was average. Nice place, nice ambiance... enjoyed my food. This is the best "new" for us restaurant we have eaten at in some time and it is without question a "keeper". The food is interesting, innovative and delicious. The service was excellent. Location very convenient in the theatre district. We will be going back and taking our friends. In particular, the Tiger Shrimp dish was superb and the saag paneer (which i order at every Indian meal) perhaps the best I've ever had. Lamb ribs and cauliflower latkes also great. Just a wonderful restaurant experience! Came here for business lunch. Service was attentive. Food was excellent. I definitely plan on coming back in the evening for dinner. Very good food beautifully presented. Okra salad is a must. Surprisingly nice experience for theater district. Great service, delicious food, conveniently located for theater district and an extensive drink/cocktail menu. Lots of interesting food selections, all cooked to perfection. Decor is basic, but it more than makes up for that in amazing food and great service. We will return. Really wanted to love this place, especially after reading about the Michelin-starred chef and numerous glowing four and five star reviews, but I ultimately left my lunch feeling unsatisfied. 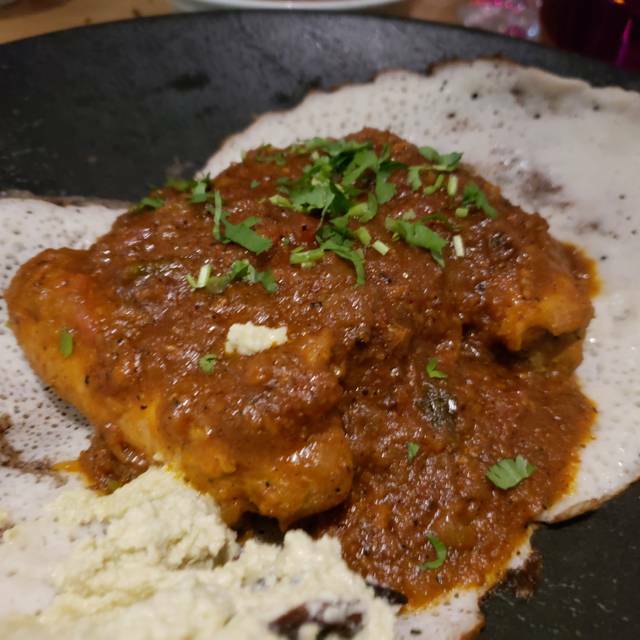 The problem is that in an effort to make this place" Indian-modern", they've taken all the soul out of what makes for me a transcending, exotic experience when I go to an Indian restaurant. The décor has the touchstones you'd expect, lively patterns on upholstery, an elaborate mural, vibrant colors, but during the day, the lighting is stark and white like a big box store. Not cozy. We had the $18.50 lunch special with choice of two menu options which seemed like a good deal. The portions are adequate to miniscule. I was looking forward to the cauliflower "latke", which was tasty, but was more like two tiny cauliflower "knishes" with a tiny dab of cranberry jam on top. Nothing else with it and it ate a bit dry. The tomato watermelon salad was a sad dish of tiny cubes of sweet melon and off-season tomatoes in a water dressing and tasted very bland to me, although others liked it. We had the stuffed paneer entree, which was small triangles of crisped paneer in a pool of garden variety Tikka sauce. Worst offense was the naan, which came out looking pillowy and temptingly golden, but tasted sweet, with an aftertaste of baking soda, like a Bisquick pancake. If these dishes had been served on trays in a takeout, I may have been more forgiving, but I was not impressed. The service was very casual, friendly and attentive. This place has a lot of potential. It's not the usual Indian menu. It's quite creative and draws a bit from other cuisines--cauliflower latkes anyone? I would recommend that they tell people that the goat curry has bones in it before they order it, especially since the similar lamb stew had no bones. The service could be sharper since the prices are more fine dining than downtown 6th street. Be careful if you order a Manhattan and don't specify the booze. Their drink menu has what they call a Manhattan, but it's made with rum! Not in Manhattan is a Manhattan made with rum. Excellent! We loved it! We will definitely be eating here again and will recommend to others. Ate before a show- glad I got there a little early because as it got busy the service was slower and afraid I would have missed my show- food was great!! Wish I had more room to try more dishes. Great variety, everything looked great. Our food was delicious. We picked Saar for a number of reasons. It is incredibly close to the Gershwin theatre, they know the ingredients of all their food and label each dish as gluten free or vegan, and we love Indian food. Saar did not disappoint. The food was great, so flavorful and the gluten free options are abounding. Prices were fair for location. You can see the theatre from inside it's so close. Service was very good. Will absolutely return. Overall a fair experience. Food was average. Nothing exceptional. Service was great and they did all they could to make us feel comfortable. Noise level was a bit high. Interesting eclectic menu. Really good saag paneer. Barbara is the Best , very knowledgeable and engaging with customers.